Is this really your table in your home?! When is tea time?! I want to wear a pastel dress and possibly white gloves! and spend all afternoon giggling with you! This truly looks magical. I hope it brings you much joy when you walk past it. lovely vases and pitchers . . . yummy sugar cookies . . . beautiful table. Oh, Suzanne this is beautiful! 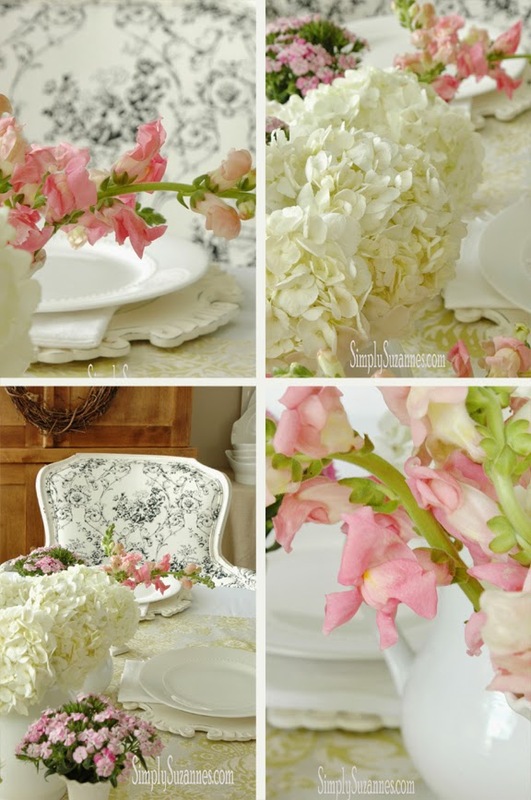 I love old fashioned flowers like snapdragons and yet you have a modern twist with the decor that just charms! Great scape! Happy Easter! Your arrangements are so beautiful! I love the white on white look, with all of that color coming from the flowers. So pretty! Those are some knock out flowers! 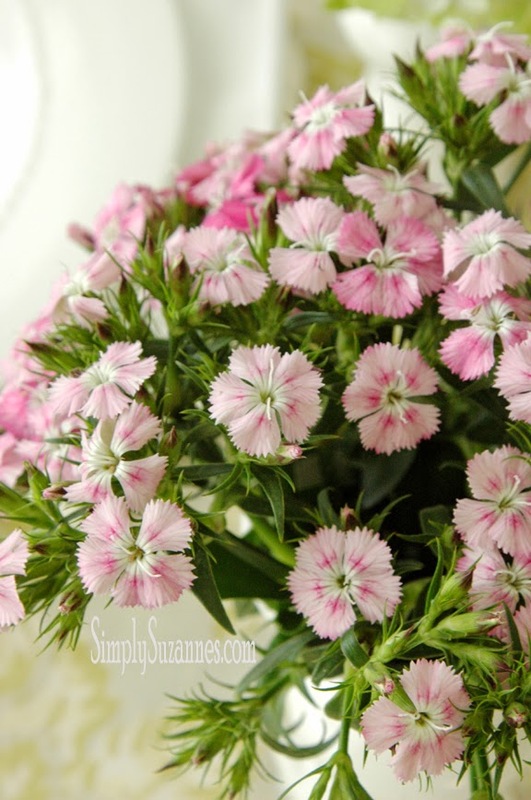 Love the soft pinks! You are inspiring me to begin to collect white dishes for my "one day" kitchen hutch! Wow! All so beautiful......I am in awe! Beautifully done! The gorgeous blooms really stand out against the delicate white! Simple Elegance. Classy, light and sophisticated. You set an amazing table. so bright and light and elegant! Love your table!!! Totally beautiful! 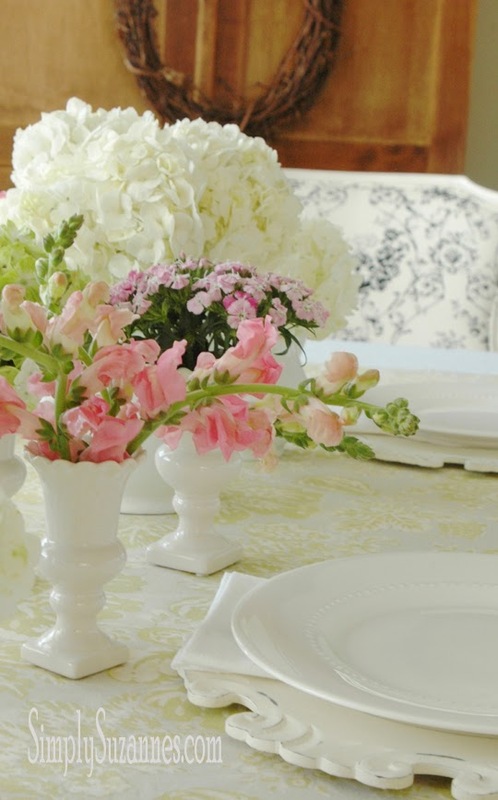 The flower arrangements are lovely and so are your White dishes in the stunning setting! 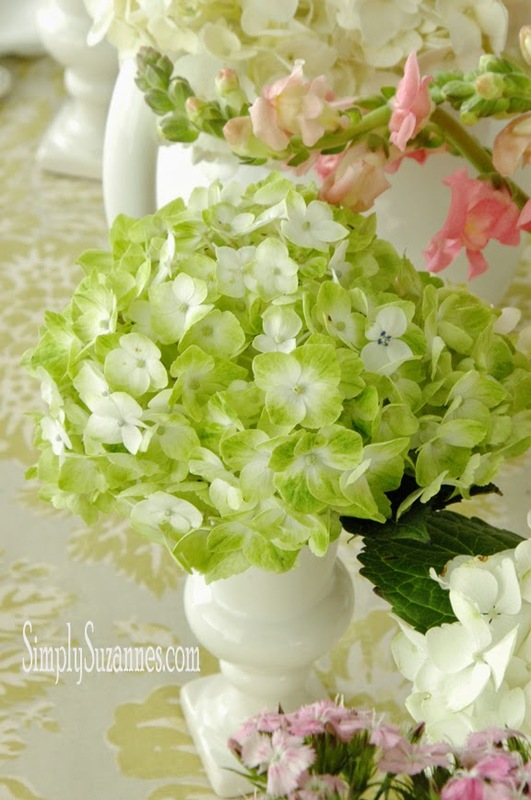 Suzanne...I wanted to follow you as I love your blog, but couldn't find the link! Please let me know. Suzanne, this is simply gorgeous. 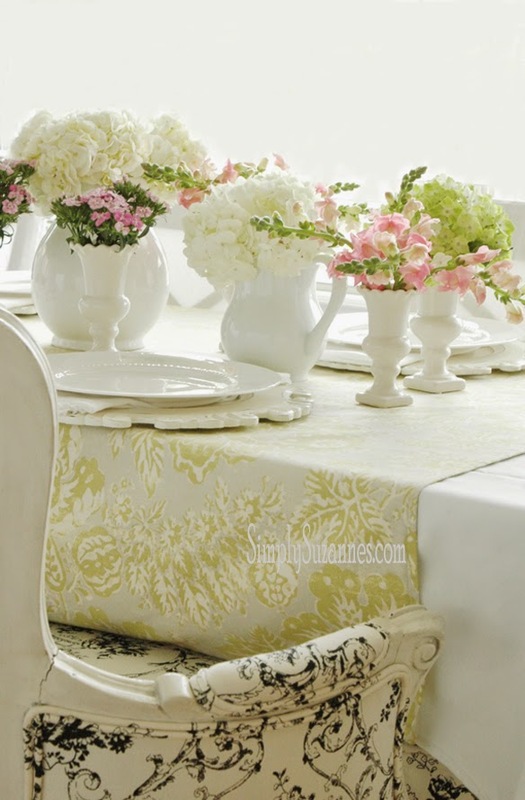 The soft pastels with the crisp white are so romantic. Love the pink snaps! Very spring-y! Love the colour combinations and softness of your photos! PS: I'm back again to suggest you turn off the Word/Number ID on your comments (blog settings). It is a hassle and not needed and I'm sure you'd get even more comments! Wow! Such a stunning table! I popped over from Moonlight & Mason Jars-- thanks for sharing! Beautiful...such soft elegance. Thanks for sharing on the Thursday Blog hop! Love how light and airy the room feels. Photos are terrific! What a gorgeous table. I really like the beautiful soft colors and all the light shining through the room. Such a light and fresh looking table! It's gorgeous! First time visiting your blog via link party Share Your Cup Thursday. Have a great weekend! What a stunning post! Some of the loveliest photos I've seen in quite a while. I'm visiting from Metamorphosis Monday. Stop by and see my porch makeover if you get a chance. I'm your newest follower, too. Wow, this is simply stunning! Everything -- the pitchers, the vases, the flowers -- ahhh! Such a beautiful setting! 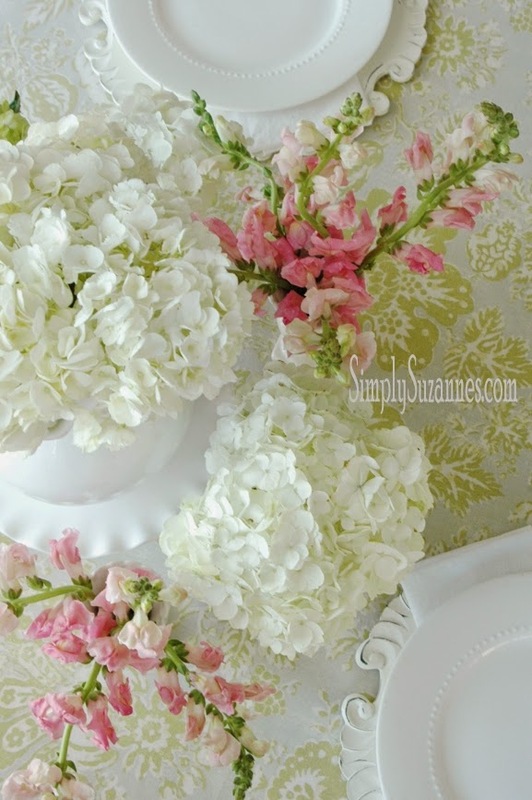 Love the flowers in simple white vases. Thank you for sharing it at to What We Accomplished Wednesdays. Have a great week! The flowers are gorgeous and my, I love that chair! Thanks for sharing with SYC. How beautiful! I just love the little bud vases! 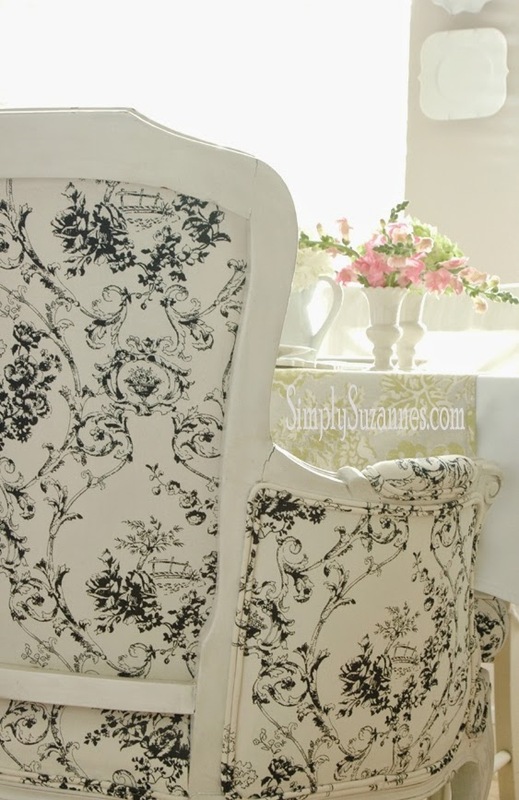 I love the soft colours on your table and above all, that black and white toile chair! 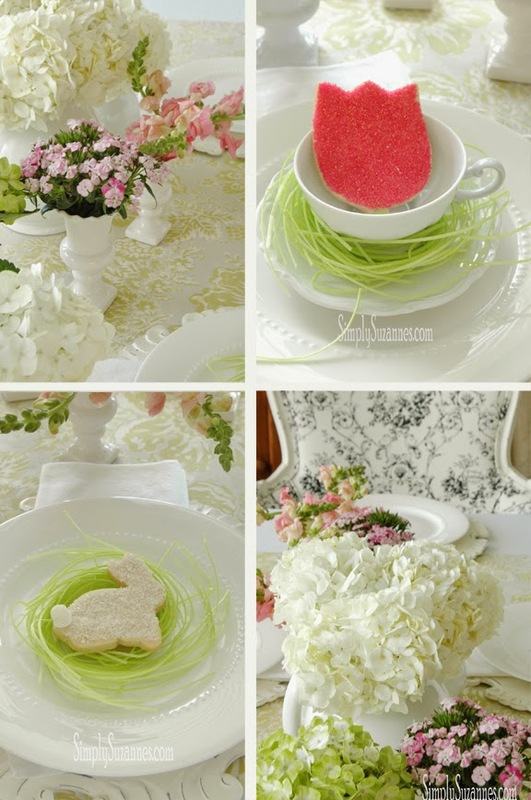 This is a stunning table setting! So gorgeous and your photos are excellent! So pretty I could sit and stay all day! Hi Suzanne, hopping back to let you know that I am featuring you at SYC this week. This should be on the cover of a magazine. You have some serious skills!!! I can just get lost in your photos! Thanx for sharing such beauty at THT! Hi Suzanne, so pretty with all the whites and the lovely flowers! It's all beautiful! Did you cover the chair, or have it covered? I've been looking for a fabric like that for a LONG time. Can you tell me about it? Beautiful Suzanne, So light and bright. This is a wonderful sight to see after all of the dreary weather around here. The vases, the lovely white on white table setting, and the touch of pink in the flowers all add up to a perfect Spring tablescape. 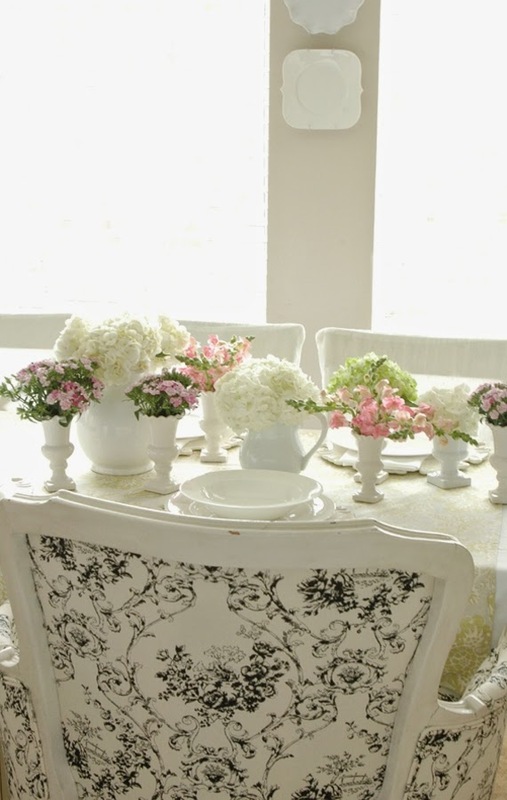 Your table is absolutely beautiful...love the pink snapdragons...and that black and white toile chair looks so comfy. Just stunning, Suzanne! I have never thought of cutting snapdragons and using for a centerpiece, but you have inspired me! 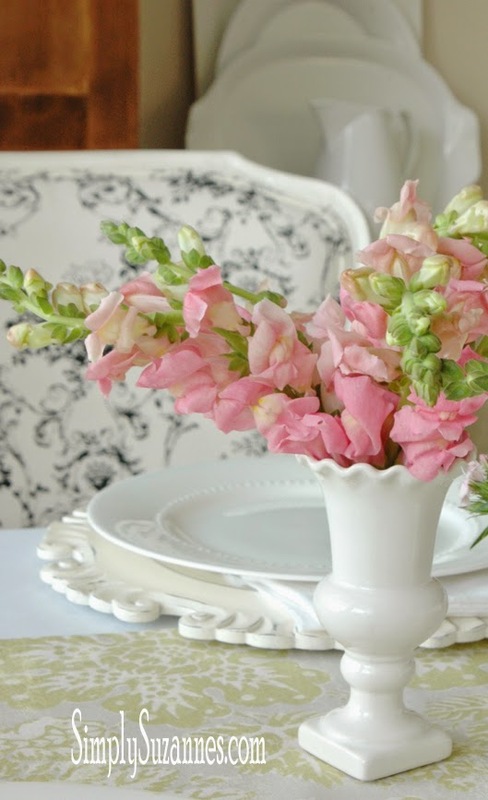 I will definitely be planting pink snapdragons in my yard this year! What a beautiful blog; just found you on Katherine's Corner! I adore flowers and glad to find another flower-loving soul! I thought that I was the only one who goes around photographing flowers of all kinds! Now following so I can continue to receive wonderful ideas from you! Oh my goodness! I love it! I found you on the Charm of Home! Absolutely gorgeous pics! What a beautiful table! I love the vases, the flowers and the cookies! Thanks for sharing! Gorgeous table. Beautiful photography! Love the whole package! Hope you'll link up more great posts to this week's party! You take such gorgeous pictures, that black and white chair with the flowers is pure perfection. Thanks for linking up Suzanne!